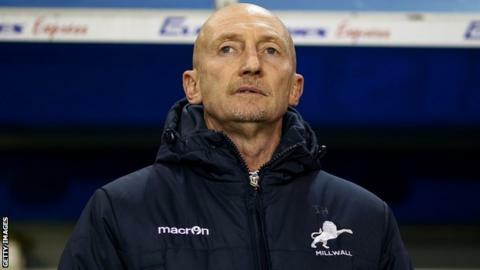 Millwall manager Ian Holloway claims his side do not receive fair treatment from referees when playing at home. The Lions have won only three of their 14 league games at The Den this season, and drew 0-0 with Reading on Tuesday. "When you are at home you usually get the lion's share of things. We don't," the 51-year-old told BBC Radio 5 live. "If I told other people they would not believe it. Ask [ex-Millwall boss] Kenny Jackett. He knew what it was like and it is driving me insane." He added: "If I had some hair before the start I wouldn't have any now as I would have pulled it all out." The former Blackpool and Crystal Palace boss is in his first full season in charge of Millwall having taken over from Steve Lomas last January, and his side are currently 22nd in the Championship table. "The fans are just honest, hard-working people who shout for their team," he said. "You have got to be strong enough to go out there and be totally impartial. "What I don't believe I see is the same for them and the same for us. "Kenny Jackett told me 'Ollie, try and keep your calm'. How can I ever stay calm with my personality? It's just horrendous." Holloway was unhappy when teenage defender Sid Nelson was shown a straight red card for a challenge on Michael Hector before half-time against the Royals. "Sid is inexperienced but what a wonderful kid," he said. "When you are committed on a slippery pitch and the whistle has already gone - the guy toed it past him and he can't stop his kicking action. "For me it is a yellow all day long. I just don't get it." Millwall's point against Reading ended a run of five straight defeats in the Championship, and the Lions are now five points from safety.